I’m still in my happy shabby zone …. I love love love this style of card making, it suits my more is more to a T lol. I made some more Foamiran flowers using the Peony Flower Die set from Whimsy Stamps, and decided to use die cuts for the sentiment for a change. I used “happy” from the Word Die Set – Smiles, Happy and Celebrate and “wishes” from the Word Die Set – Birthday, Wishes and Magical. I also used the In Stitches stamp set around the top layer, which I heat embossed with White super fine embossing powder. I’m doing a Guest Design spot for Love to Craft and Create. They have the 0.6mm foamiran in which is sublime to work with. It’s a lot more delicate and takes less manipulation. I used the 0.6mm white Foamiran which I then coloured with oil pastels to get the soft peach colour. The dark peach flowers are made from 0.8mm dark coral foamiran, which I die cut using a Rosy Owl die set. I used these stamens for the centres of the small flowers – white stamens, mint stamens, glass stamens, pearl stamens (large flower). The papers are from two Lemoncraft packs – Heart Painted (peach) and Just Love Me (Ivory). I stamped a background stamp onto the leaves (also from the Peony set) after die cutting to add a bit of texture to the leaves. I gave the seam binding a good old crinkle! Back to my shabby cards with this one today, not my usual colour combo but I absolutely love it! I made the flowers from Foamiran using my Peony Flower Die set as well as a Rosy Dot set for the little flowers and a set of daisies. 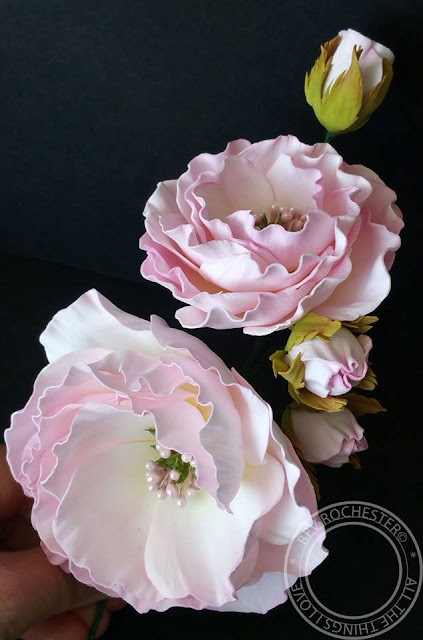 I really do love making my own flowers, they’re so very easy to make and don’t take long either. I finished off with a sentiment from the Lovely Lavender stamp set. The bird cage mask is from Imagination and the paper and little clear glass beads are from 13@rts. Saturday truly was the best day ever, I learned techniques and tips that even if I sat and watched You Tube videos for 100 years I would never ever have picked up the knowledge Ewa shared with us. A huge thanks to Ewa and also to Monika who ran around after us as well as translating from Polish to English - you are both total superstars!! Here's what I made from the morning class. My mind was blown at just how much I achieved in a day. Five cards in three days – I need to go lie down in a dark room lol. This is my last card for the week, showcasing the sper cute Puppy and Present which is part of the Whimsy Stamps June release along with another of the fab sentiments from the Polka Dot Fun stamp set. I’m still crazy for all things Foamiran so I made the flowers … the large flower is made using the Peony Flower Die Set that was released last month. Love this little puppy, and went for a vintagey colour scheme for this one. A closer look at the flowers, along with the Peony Flower die I used a daisy set and a Rosy Dot set. Have a fab weekend. I’m off down to Nottingham for a Foamiran Flower Course organised by Love to Craft and Create via their Facebook group Foamiran Flowers & Tips and I’m. SOOO. Darn. Excited!!! I’ve two more cards featuring products from this month’s Whimsy Stamps release. First up is a *couch* pink card for a change …. not! The stamp set I used for the sentiment is Thank You Friend, which I;ve teamed with some Foamiran flowers made using the Peony Flower die set that was released last month as well as another daisy. Gotta love me some pink prettiness. My second card I’ve made using the Paws to Remember stamp set. I’m not a fan of making sympathy cards – I live in denial!! They just don’t sit right with me so I made a thank you shaker card instead. I love when a stamp set is versatile enough that it can be used for more than it was designed for. The sentiment is also from the Thank You Friend set. I’ve another card tomorrow, and yep … it’s got a touch of pink on it! The Whimsy Stamps June 2017 release party has started over on the Whimsy Stamps and Inspirations Facebook group. 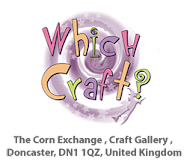 Pop across to join in with games, fun, and a chance to win Whimsy prizes too. I’ve made a fun card for the boys using the fabulous new Life’s a Beach stamp set from the new release – more penguin goodness, and the sentiments that come with the set are pretty special too!! My second card is a bit on the different side (for me at least) in that I made my own background paper using distress inks and the fab Polka Dot Fun clear stamp set, and this is another card I loved making and was delighted with the result. I heat embossed the polka dots then rubbed over different coloured distress inks using ink dusters and whilst I had the embossing powder out I heat embossed a butterfly from the Lovely Lavender stamp set. I finished the card off with some handmade Foamiran flowers using the Peony Flower die set as well as some other flower dies I have in my stash. I used the Hand Stitched Nested Rectangles for the stamped layer and the sentiment is the Happy Sayings die and stamp sets. Love how the daisy turned out – this was done using the Tim Holtz Tattered Florals die. I'll be back tomorrow with two more cards. I love love LOVE these little penguins drawn by Crissy Armnstrong, and I love that you can get them from Whimsy Stamps in both rubber and digital (tho what’s in rubber is different to the selection in digital format ….. so double the cuteness!) Today’s card features Penguin Flies and just released just this week! The sentiment is from the Happy Birthday to You stamp set. I used copic markers to colour up the image. 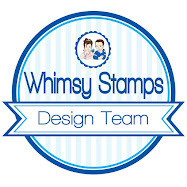 June’s Customer Appreciation Stamp set from Whimsy is this fab clear set. Pop across here to check out the deets. It’s been a while since I coloured up one of these little Wee cuties. This is Sleeping Cutie, from the newest Whimsy Stamps release. I’ve also used the Peony flower die set to make the large foamiran flowers. The sentiment is from the Friendly Flowers sentiment set. The star nestled beind the sentiment is from the Pierced Stars die set. 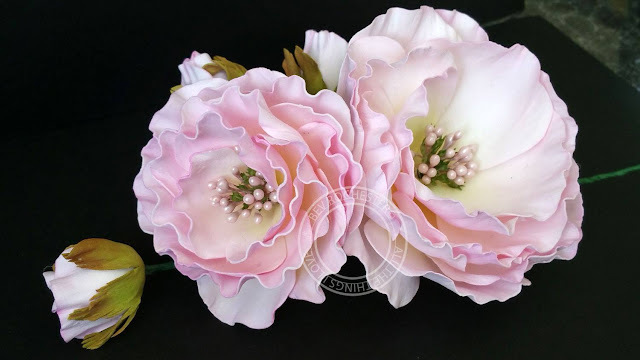 Love making these foamiran flowers, they are so very addictive. The papers are from a First Edition pad, I think they fit so perfect with the sweet stamped image.